MOSCOW, January 23. /TASS/. Israel’s practice of spontaneous strikes on Syria must be brought to an end, Russian Foreign Ministry Spokeswoman Maria Zakharova told reporters on Wednesday. The diplomat called to think about possible consequences of sparking a new spiral of tension in the Middle East. On January 20, Syria’s SANA news agency reported that Syrian air defenses had repelled an Israeli air strike in the country’s south. On the same day, Israel announced that it had intercepted a rocket fired at the Golan Heights. The next day, Russia’s Defense Ministry stated that four Syrian troops were killed and another six were wounded in the strikes, and the Damascus airport was damaged. 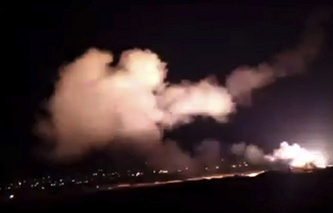 Syria’s air defenses destroyed more than 30 Israeli missiles and air bombs.